I'm embarrassed to say it has been a fair few weeks (possibly months!) since I sat down and wrote a blog post, I've kind of forgotten where to start! This seems to happen to me every year, I almost go into some kind of hibernation in the Summer time then I come out all ready to blog again at the start of Autumn. I hope you can all forgive me if anyone is still here to read my posts! 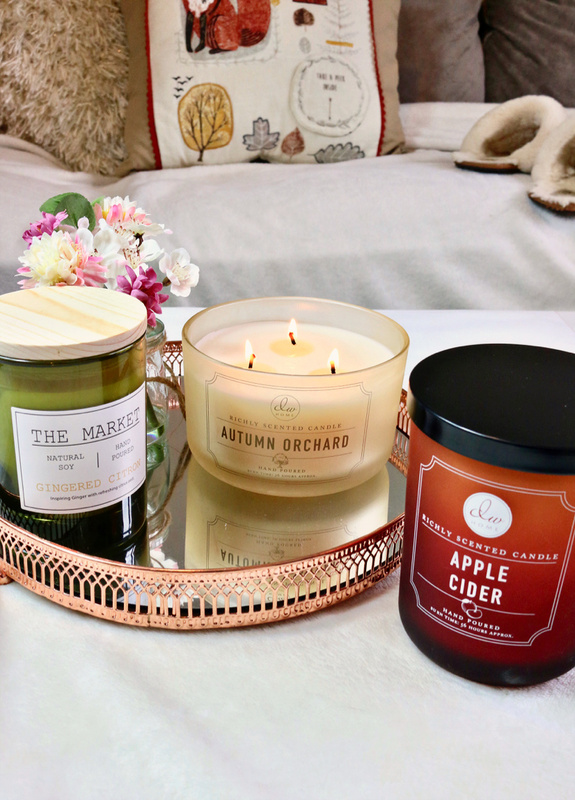 I thought I would start my kind of 'comeback' into blogging with one of my favourite posts to write, an Autumn candle haul! As soon as my Birthday in July is over, I can't help but think about Autumn! I love the start of a new season and Autumn has always felt so magical and cosy to me. I love to welcome in the Autumn season by stocking up on some new Autumn candles. A year or two ago I spent a small fortune importing some Bath & Body Works Autumn goodies in, I bought soooo many I still have untouched candles to this day. Although I do think they were totally worth the money (but I am a bit mad when it comes to unnecessary spending!) I just can't justify the costs this year with a wedding to pay for. I got myself down to Homesense to pick up a few treats. I can't believe I have only just got round to trying Homesense candles, with all the hype over the last few years I couldn't help but feel a little giddy on my first Homesense candle spree. The first candle I was drawn to was the DW Home Three Wick Autumn Orchard £7.99. It looks so cosy I was really hoping I would love it and I did! This smells like Christmas in a jar to me, it's very similar to Bath & Body Works Leaves - my all time favourite Autumn/Christmas candle, that I have just ran out of! Autumn Orchard smells spicy and sweet, it reminds me of walking into Hamley's in London at Christmas time. To me it's a mix of sweet cinnamon, spicy clove and vanilla Christmas cookies - Autumn in a jar for only £7.99! The next candle I loved was the DW Home Two Wick Apple Cider £7.99 I love the Autumn red/burnt orange jar it's so gorgeous. I'm normally a fruity candle kind of person so I love finding a fruity but spicy Autumn scent. I love that this isn't super intense and over powering. When you have a million and one spicy Autumn candles in front of you to try, they can be very overwhelming and maybe a bit over powering. Apple Cider has a subtle warm spicy scent with a hint of fruity apple. I can't wait to try this one. The last candle I picked up isn't a typical Autumn candle. As I mentioned, it can be a little overwhelming heading into the Autumn candle section, everything started to smell way to strong and spicy to me. I picked up The Market Gingered Citron £6.99 - admittedly I thought it said Gingerbread! This scent is right up my street, I'm obsessed with zesty citrus scents! This smells exactly like the citrus Shake N Vac and I'm kind of obsessed with that smell. This isn't the typical Autumn candle I would normally go for, but I still think this is going to be lovely this time of year. It has a slight ginger hint to it which makes it feel warmer than most fruity citrus candles, making it gorgeous for when the weather gets colder. I'm so pleased with my little Autumn treats from Homesense and can't wait to pick a few more nearer Christmas time. My home is starting to feel so cosy and festive - I love it! Have you picked up any Autumn candles this year beauties?